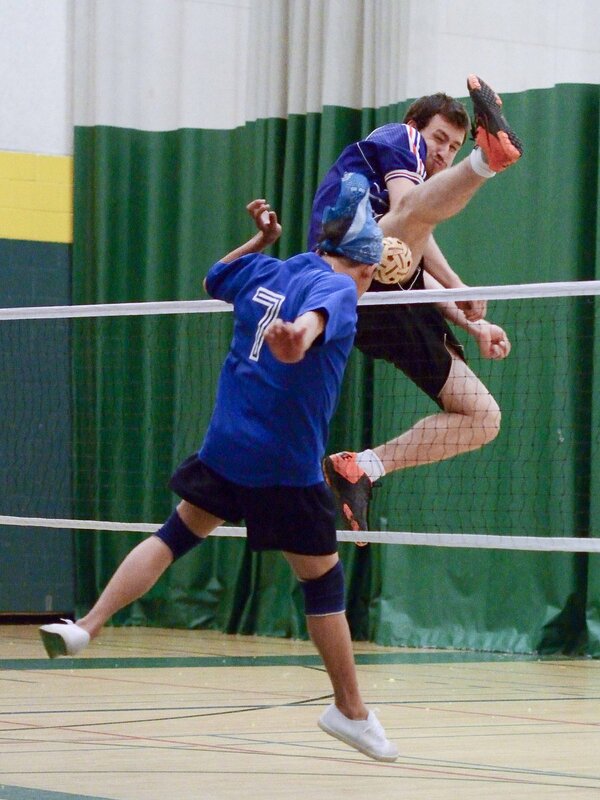 WELCOME to the official website of the Sepak Takraw Association of Canada (STAC)! 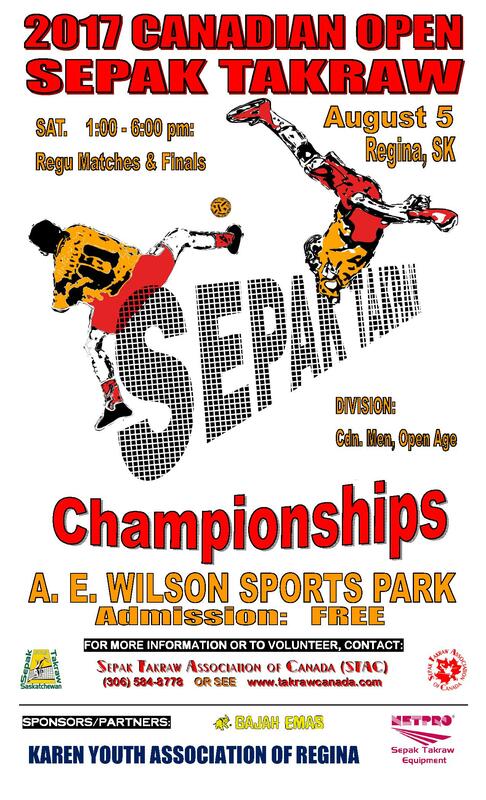 Sepak Takraw is best described as KICK VOLLEYBALL or SOCCER VOLLEYBALL. 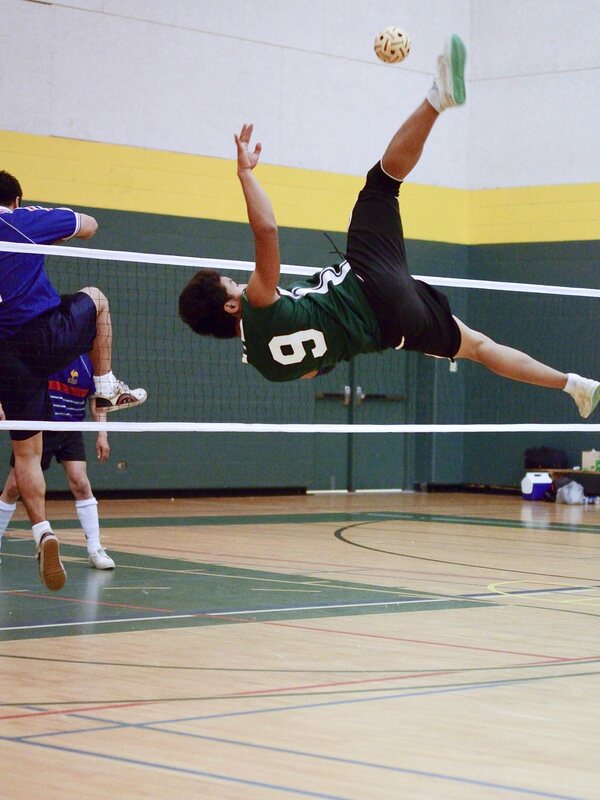 Enjoy Sepak Takraw equipment, resources, training, coaching, officials, DVD, videos, books, articles, news, pictures, and networking information found and updated here. Come back often! 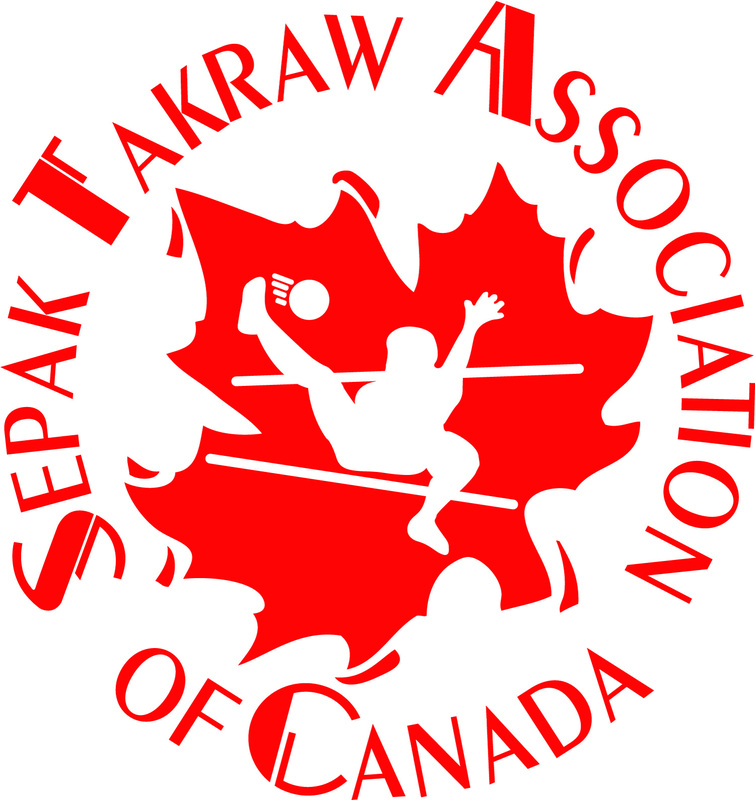 "Like" our new Takraw Canada (STAC) Face Book Page for a chance to WIN Sepak Takraw Products! 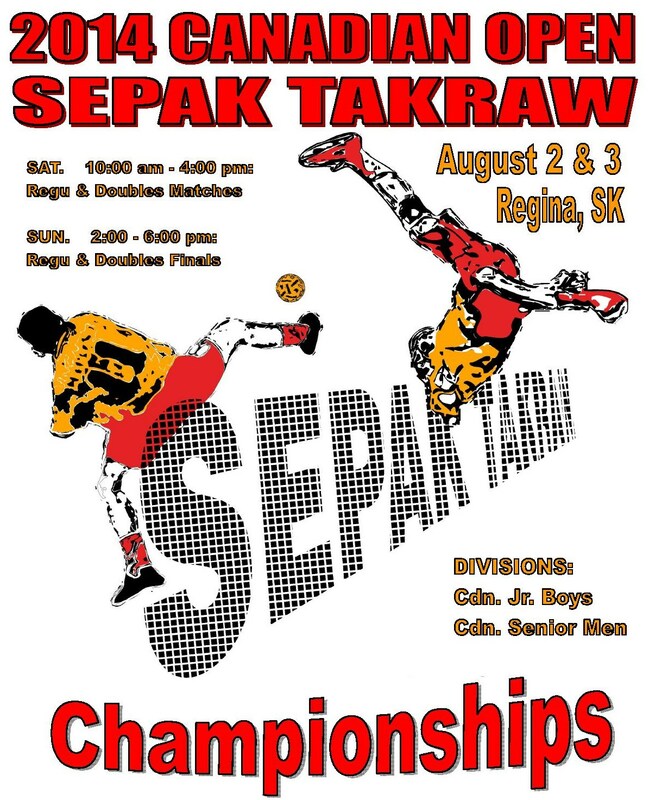 STAC is pleased to announce that the 2017 Canadian Open Sepak Takraw Championships will be hosted in Regina, SK, August 5th, 1:00 - 6:0 p.m. by the Regina Karen Youth Association as part of the Karen National Youth Conference! 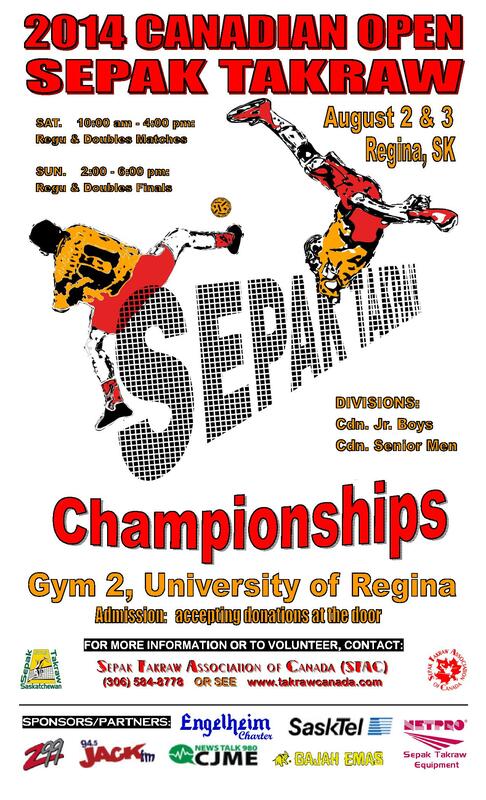 There will be teams from all across Canada, including THREE teams from Regina to represent Saskatchewan! It will all take place at A.E. Wilson Park, just north of Dewdney Ave. on McCarthy Blvd. ALL TEAMS NOTE: In the fall of 2013, the International Sepak Takraw Federation (ISTAF), in it's Congress, changed the rules to revert back to BEST OUT OF 3 SETS WINS A MATCH, BUT WITH EACH SET GOING TO 21 POINTS, HAVING TO WIN BY 2 POINTS UP TO A MAXIMUM SCORE OF 25 POINTS ... EVEN FOR THE TIEBREAK SET IF THE 3rd SET IS REQUIRED. All matches will be played following these new international rules. Udon Thani, Thailand: Secretary General of the International Sepak Takraw Federation (ISTAF), Abdul Halim Kader, singled out and highly praised the Sepak Takraw Association of Canada for its development of the sport, stating, “Canada has set the standard, has created a model that any other country, especially the newer countries in the sport, can follow.” Richard Engel, President of STAC and administrator for Sepak Takraw Saskatchewan, was in attendance at the ISTAF’s Congress today that was represented by over 70 people from 36 countries altogether. 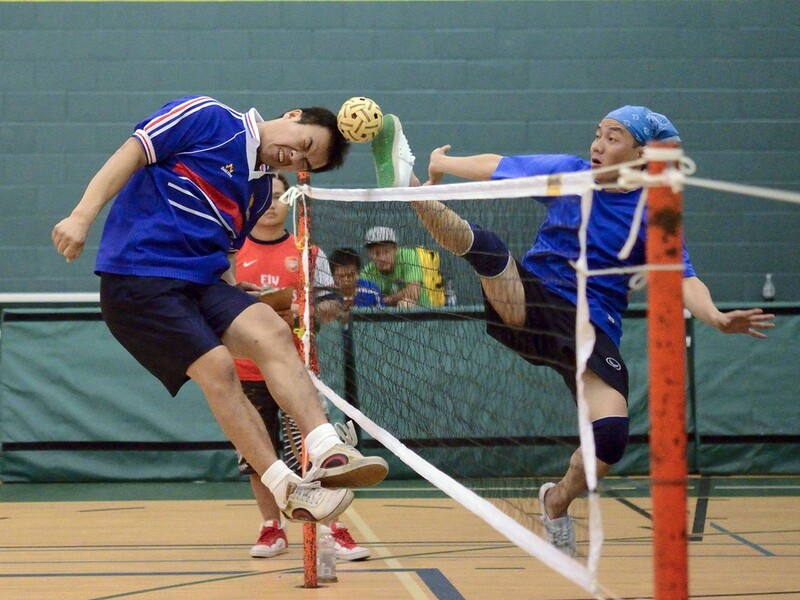 It was hosted at the same time as the 28th King’s Cup Sepak Takraw World Championships. Mr. Engel presented ISTAF with the latest Editions of the Sepak Takraw Manuals that he has authored, and which have been instrumental in the development of the sport in Canada, USA, Europe, and even Asian countries … the 3rd Edition of Engel’s “Sepak Takraw 101” was translated into Indonesian language and put into 3000 schools in Indonesia in a joint project between Engel, STAC, an Indonesian publishing company and the Indonesian government. STAC’s Participant & Coach Development Models were also praised as templates that other new countries in the sport can follow to help them make their sport development plans. As well, at today’s Congress, Engel was re-elected into a third term as 1 of 10 Vice Presidents of ISTAF from 2013 - 2017. Unfortunately due to a lack of funding and no sponsor, STAC was not able to send a team from Canada to compete in the King’s Cup, even though, as seen from the recent national tournament hosted in Calgary last month, Canada has several teams that have the level of skill necessary to compete in a world championship event like the King’s Cup. Attached Picture: Elected ISTAF Council Members for 2013 – 2017, Richard Engel is in the back row, third from the right. NEW EDITIONS OF SEPAK TAKRAW 101 & EVALUATION MANUALS AND OFFICIAL RULE BOOK JUST PUBLISHED! The Sepak Takraw 101, 4th Edition now has updated pictures and information throughout as well as a comprehensive "Phycological Training" section added, very useful for coaches wanting to take their competative teams to their highest potential levels. The Rules are now NOT included in this manual, rather, a decision was made to keep the rules seperate, in it's own book. The Get Active Get Your Kicks - Sepak Takraw Skills Benchmarks and Evaluation Resource Manual, 2nd Edition has also just been re-written and published to be more applicable to Sepak Takraw programs anywhere. The Official Sepak Takraw Rule Book, 4th Edition has been re-written to incorporate the new interntional rules in the games that came in 2011/2012. 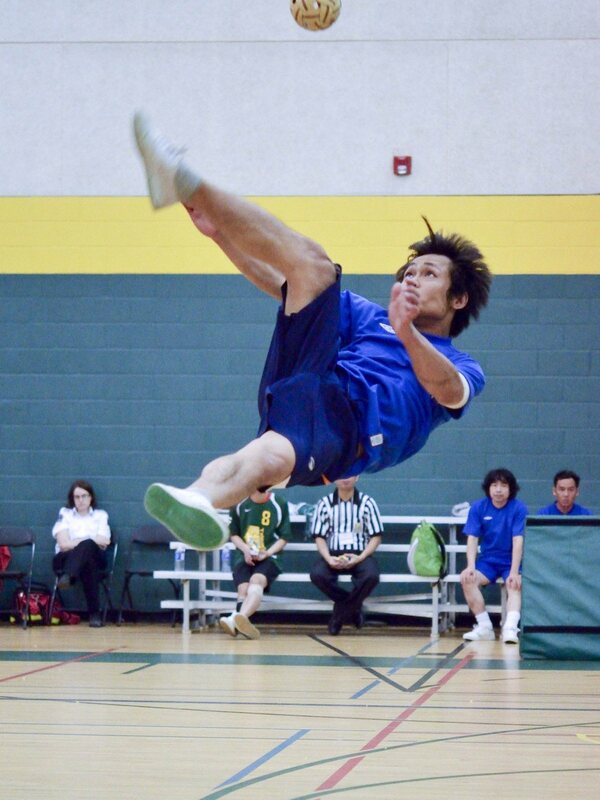 STAC is pleased to announce that the 2013 Canadian Open Sepak Takraw Championships will be hosted in Calgary, AB, August 17 & 18, in the Calgary Volleydome. A BIG WELCOME TO TEAM COLOMBIA, SOME OF WHOM ALREADY ARRIVED IN CALGARY TODAY! CLICK HERE for details, registration forms, and sponsorship & volunteer opportunities. SEPAK TAKRAW CDM, showing Certification/Training at each Context. Another significant rule change has been a move to having each regu serve 3 consecutive serves, regardless of whether or not they received the points for the ensuing rallies of those serves ... so in this way, serving has now become more like it is in table tennis, which helps even out the play, especially when there is a very strong, serve-dominating regu. As well, the new rules now allow for each Regu to have one substition per set (5 possible sets). CLICK HERE to view/print ALL the Rule Changes (there's 7 more). The 2012 Canadian Open was held at the U of R in gym 2 from July 21 to July 22. Set up the day before the tournament was smooth and quick and the U of R staff members were very helpful when needed. Unfortunately, the week leading up to the tournament saw some last minute cancellations from the 13 teams registered, most disappointingly was China and Malaysia (due to VISA issues, etc.). It was still a great event in spite of the no shows and no international division. Throughout the event a constant flow of approximately 200 plus spectators attended and were thrilled to see the acrobatic action involved with the spiking and blocking (without use of hands or arms)! The opening ceremonies started with all the teams walking into the gym and lining up in front of the spectators, then everyone sang ‘Oh Canada’, followed by a speech from Sask Sport Board Member, Robert Barrand, before the matches resumed. Click HERE to read the Post Event Media Release! Condolences go out to STAC president, Richard (Rick) Engel, and his family, as his father, Oliver Engel, passed away very suddenly this summer, just 2 1/2 weeks after being diagnosed with Esophagus Cancer. 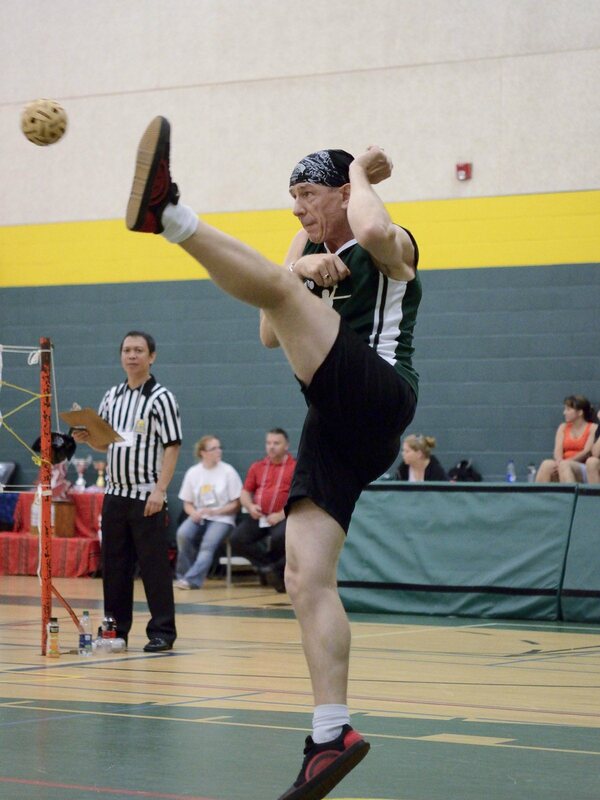 Oliver was well-known to STAC and Sepak Takraw in Canada as the bus company Engelheim Charter (which is wife continues to operate) is a long-time supporter and sponsor of the sport in Saskatchewan. Oliver was loved by all and will be dearly missed. 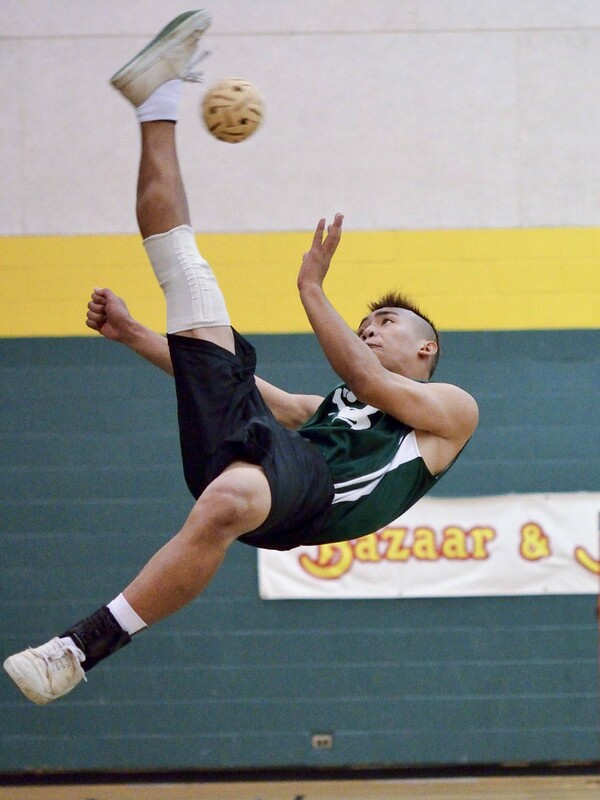 Successful School Sepak Takraw Leagues have been springing up across the country. 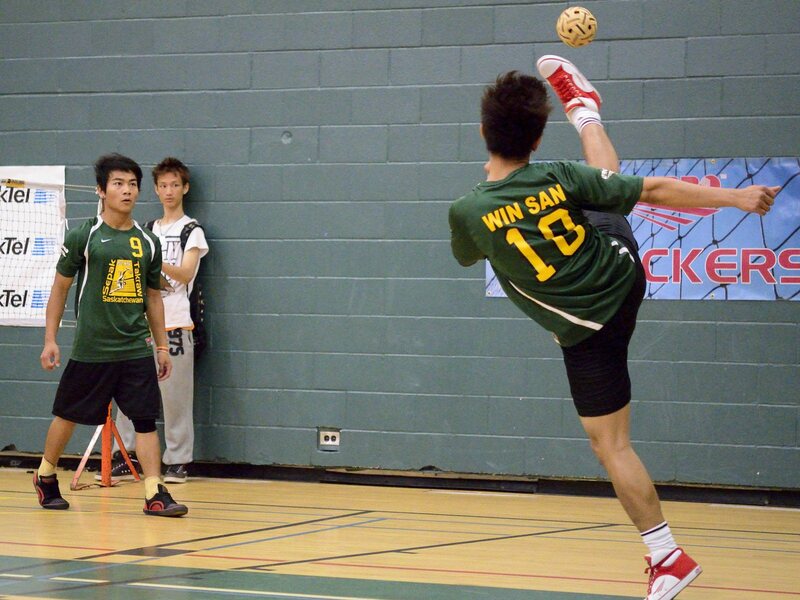 Why not start an Inter-school Sepak Takraw League in your area or School District? It seems that the best time to plan on running a league and playing games against other schools is around mid-March to the end of May, so about 2 - 2 1/2 months, between basketball and track (whatever that time frame translates to be for you). From the left menu bar, select "Schools that have Sepak Takraw", then click on your province and you can view a list of schools by city that play Sepak Takraw at one level or another. The list is not at all complete by any means, but it's a start. This will help you network to set up a league or even just a fun tournament with other schools near you. Each year there is a national tournament with a junior (19 & under) division in which your students could compete in. So far players/teams from BC, AB, SK, MB & ON have competed at the nationals in the Jr. division. Why not get your school's KEEN KICKERS ready for the next Canadian Open?! 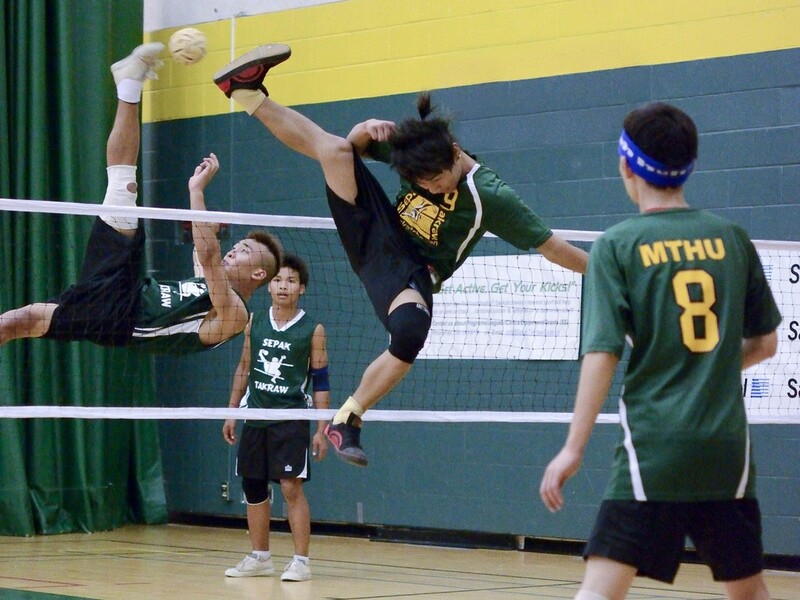 • STAC will invite top teams in each province to attend the next Canadian Open Sepak Takraw Championships (school age competing in the Junior Division, which is 19 & under). So generally for most schools, the after-school time commitment ends up being only a few hours on one day. This provides a very manageable way to introduce and participate in this newer sport … and your students will love it, they will be active and will be developing eye-foot coordination, flexibility and agility all at the same time! 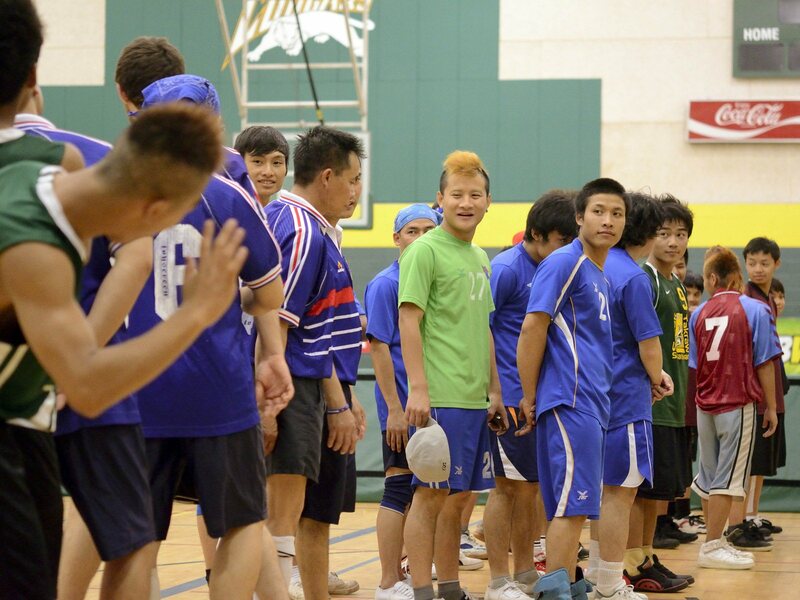 • Sask FUN Family & Corporate Challenge Sepak Takraw Tournament, modified games, non-regular players, Regina, July 1, 2013. 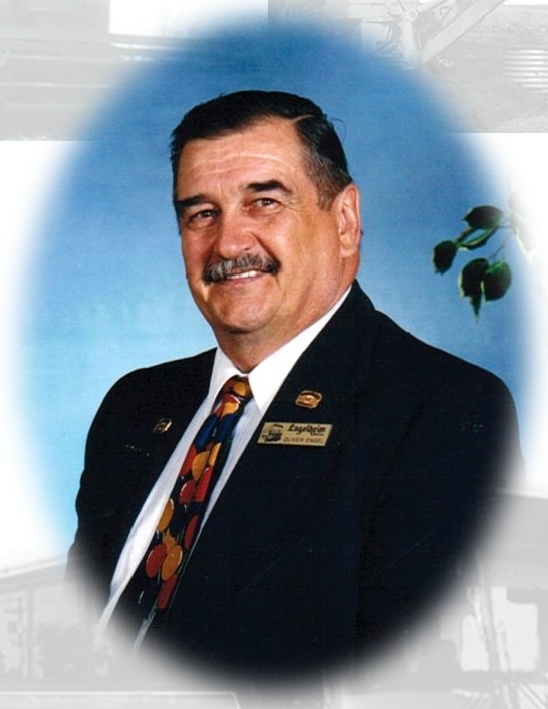 BRITISH COLUMBIA: Langley, BC, TBA, contact persons under "Canadian Contacts". VANCOUVER AREA: TBA, contact persons under "Canadian Contacts". Thursdays, 6:00 - 7:00 p.m., W.P. Bate Elementary School, 2515 18th Street W.
TORONTO: TBA, contact person under "Canadian Contacts" for more details.